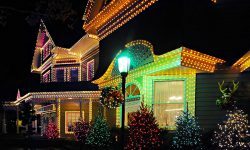 Every year, the Christmas season brings a sense of joy and cheer to millions of people all around the world. But, apparently, it also brings with it some very...inappropriate...advertisements. 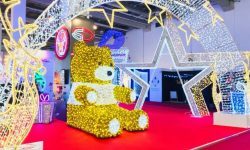 From firearms to naughty Santas and everything in between, we hope these inappropriate Christmas ads show you that the Christmas season can bring something else besides joy and cheer: unadulterated laughter. Some of the ads on this list scream inappropriate more than others. This ad from Griffin Microsheen is definitely one of them. 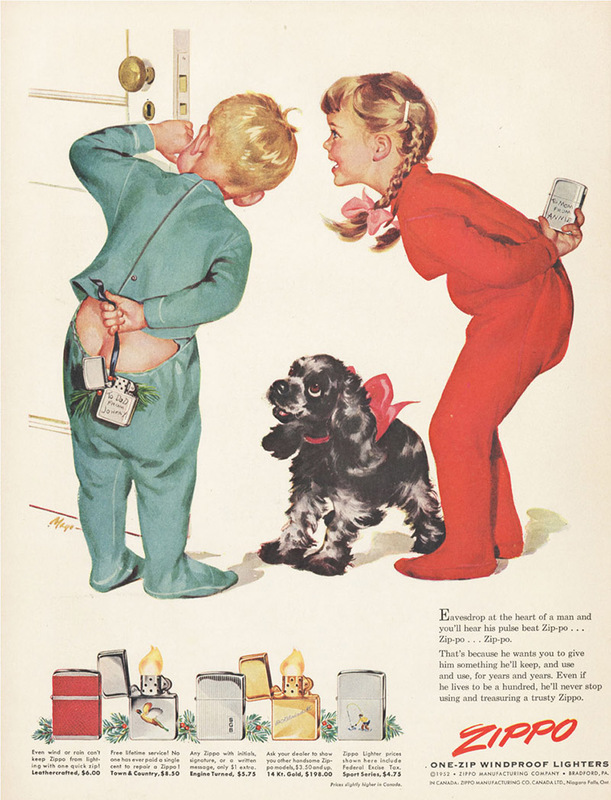 The premise behind this ad from Westinghouse isn’t anything outrageous (although a bit cringe-worthy). What takes it over the top is the crazy look in the guy’s eye. 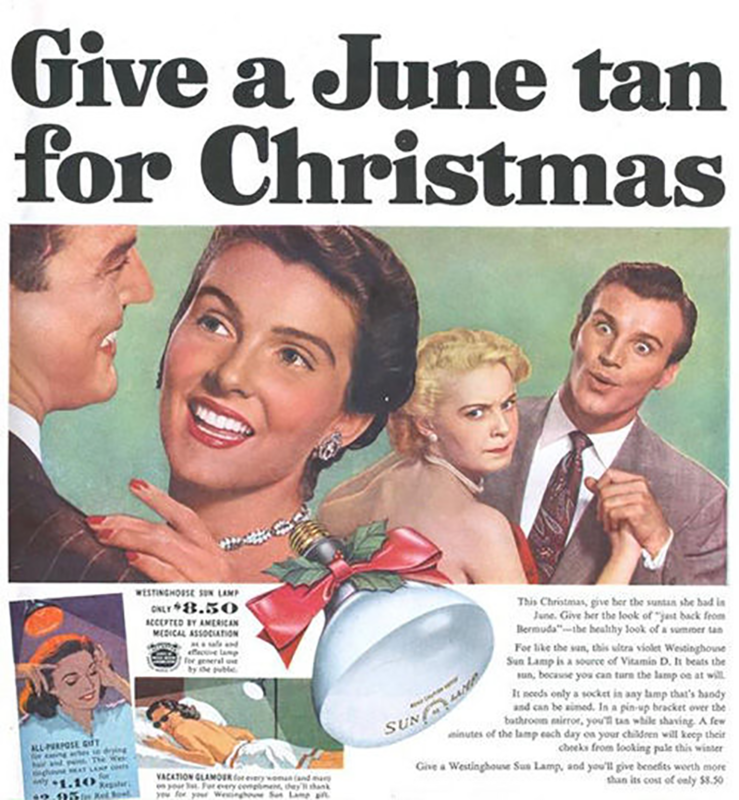 Apparently, a tan from Westinghouse’s sun lamps can put a grown man in a trance. Time for a tan! 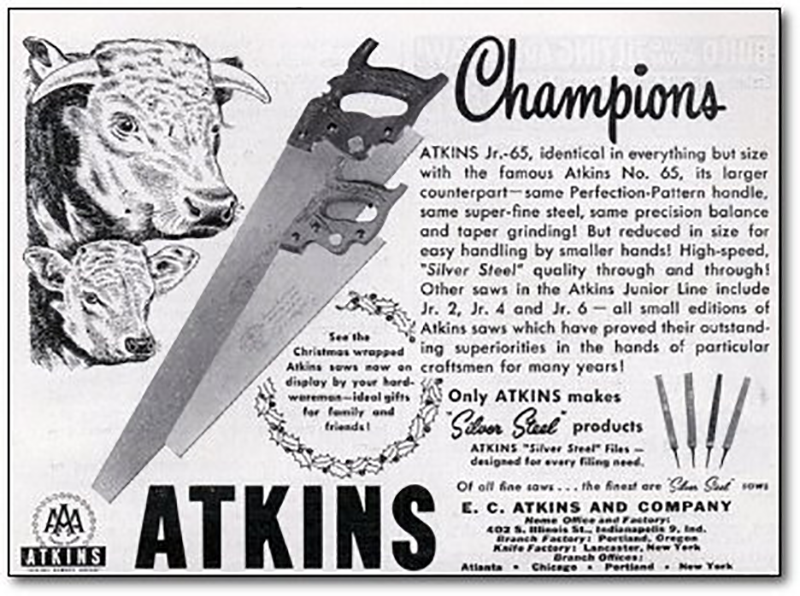 Apparently, Santa was expecting a botched Christmas the year this ad ran. Clearly, he wouldn’t have been able to make Christmas happen without Zippo. 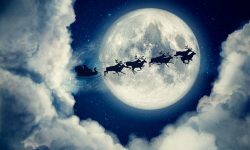 We don’t know what was going through Santa’s head at the time, but we’re glad the kids stayed safe and he was able to stop the catastrophe from happening. 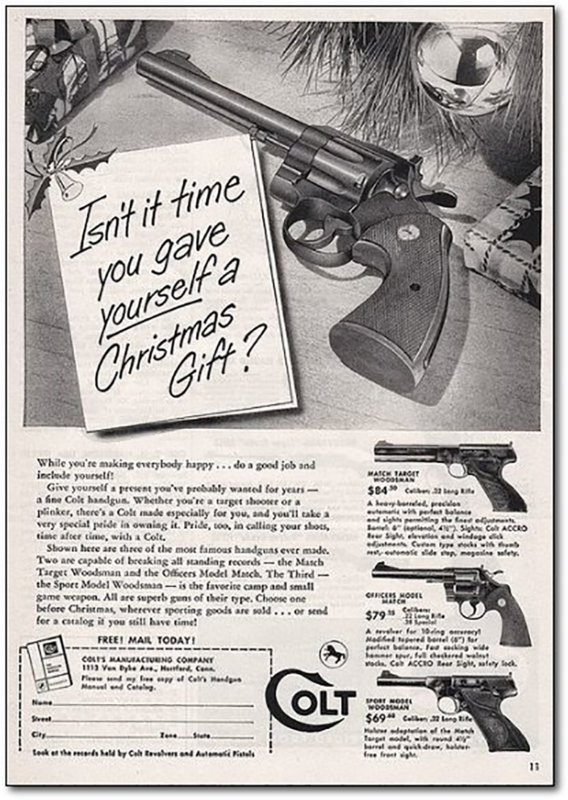 We’re not sure what’s being suggested in this Christmas ad by Colt, given the fact that there appears to be a note placed beside a revolver under a Christmas trees suggesting you get yourself a handgun as a gift. Well, at least dad or mom knows they’ll be calling the shots now when they own a Colt handgun. A Christmas ad for a funeral and cremation service is already a little weird, but hardly inappropriate. 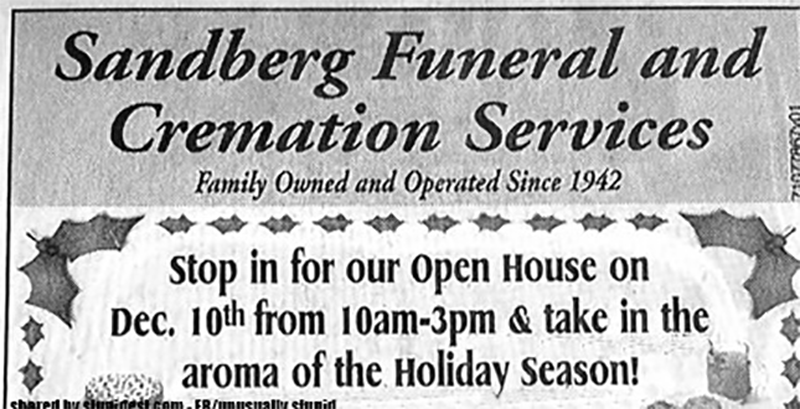 What makes this ad from Sandberg Funeral and Cremation Services inappropriate is what comes at the end of this short ad. What says “Christmas” better than the aroma of a cemetery? 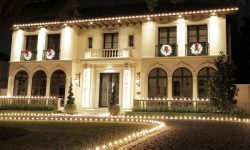 It must have been a great open house! 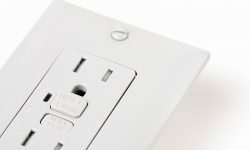 Pop quiz: You’ve know you’ve got a great product. It’s a saw that’s stronger than any other on the market. You need to show something in the ad that the saw can cut through which suggests its power and sharpness. So, what do you put on the ad? We’re not sure what they were suggesting with this (they don’t specify), but we’re afraid to ask. We really want to give The Beach House Carryout the benefit of the doubt here. 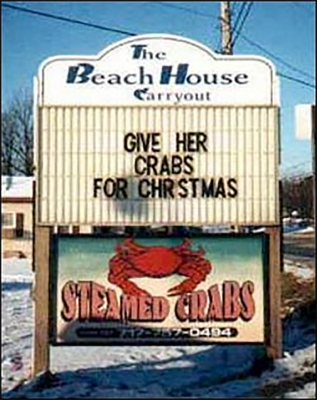 I mean, they sell crabs. It makes sense they wouldn’t catch this. And it certainly wasn’t intentional...right? 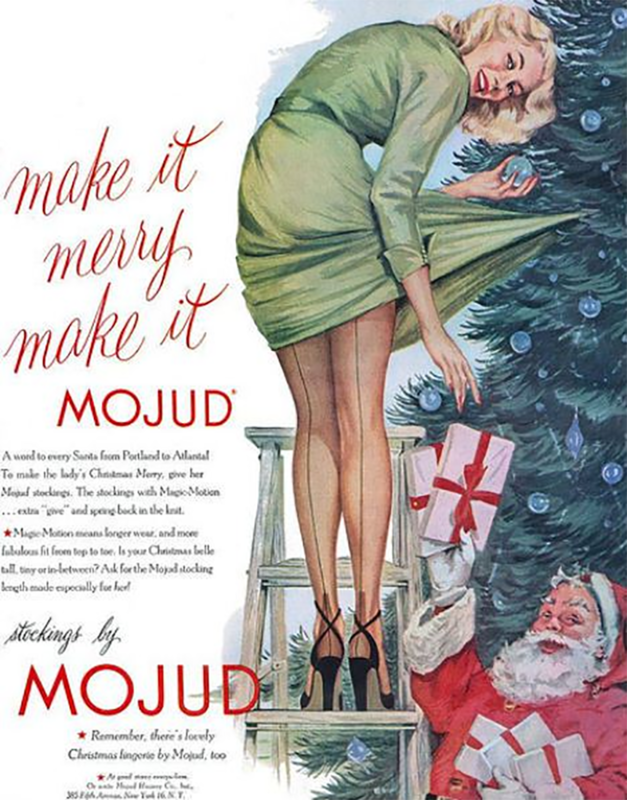 Whatever the case, the result was a really inappropriate Christmas ad. We’re not sure what is more inappropriate, the woman clearly letting her dress lift and stay that way intentionally (clearly grabbing the presents from Santa was more pressing) or Santa’s disturbing smirk from below. This old school ad from scotch tape maker 3M speaks for itself. We don’t want to make assumptions here, but we’re pretty sure that’s a severed head on a pedestal. 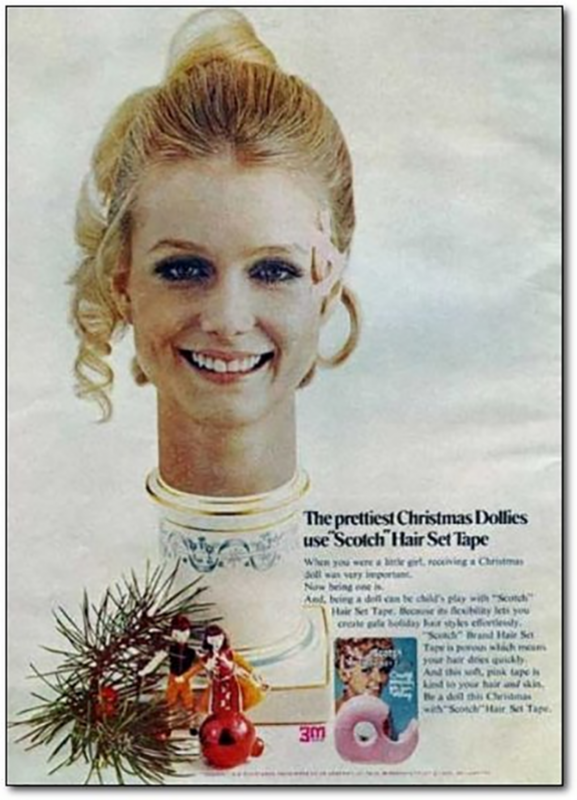 We’re not sure what 3M was thinking when they ran this ad but we’re not going to lie– we’re just a little freaked out (but hey, at least you know their Scotch Hair Set tape would look great on your life-like mannequin). 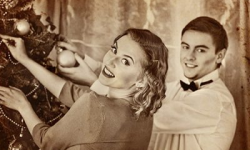 So, are these the most inappropriate Christmas ads you’ve ever seen? Know of a good one not on this list? Tell us about it!